When diabetics were asked to respond to a question about their risk for heart disease in a 2018 Harris Poll, only about half of them knew they had a higher chance of developing heart problems because of their diabetes. If your aging relative is diabetic, knowing the link between diabetes and heart disease could help you to understand their risks. Every 80 seconds, someone with diabetes is admitted to the hospital for heart problems. Every 120 seconds, a person with diabetes is admitted to the hospital for a stroke. Having diabetes makes men twice as likely to get heart disease. It makes women three times as likely. 7 in 10 older adults who have diabetes die from heart problems. 1 in 6 older adults with diabetes die from stroke. How Does Diabetes Damage the Heart? The link between diabetes and heart disease was first noticed in 1979. Years of research since have proven the link. The culprit is high blood sugar levels. Over time, it damages blood vessels. It also harms nerves that regulate how the heart and blood vessels work. This leaves diabetics more susceptible to some of the risk factors for heart disease, like high blood pressure, high cholesterol, and high triglycerides. 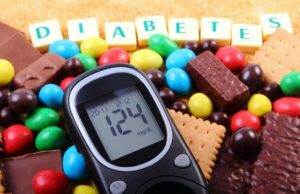 Manage blood sugar levels, keeping them as close to normal as possible. Follow the doctor’s advice for testing, medications, diet, and exercise. If the older adult is overweight, help them to reach and maintain a healthy weight. A loss of just 10 to 20 pounds can help lower blood sugar levels. Try to reduce stress since it can cause blood vessels to constrict, which makes blood pressure higher. Smokers should quit. Smoking raises the risk of heart disease even in people who are not diabetic because it damages blood vessels. Home care services can help your older family member to reduce risks for heart disease. A home care services provider can remind them to check their blood sugar levels and take medications. They can also prepare healthy meals that fit into the senior’s eating plan. Home care services providers can also increase the physical activity level of the older adult by involving them in household activities, going for walks, or driving them to the gym or exercise classes.